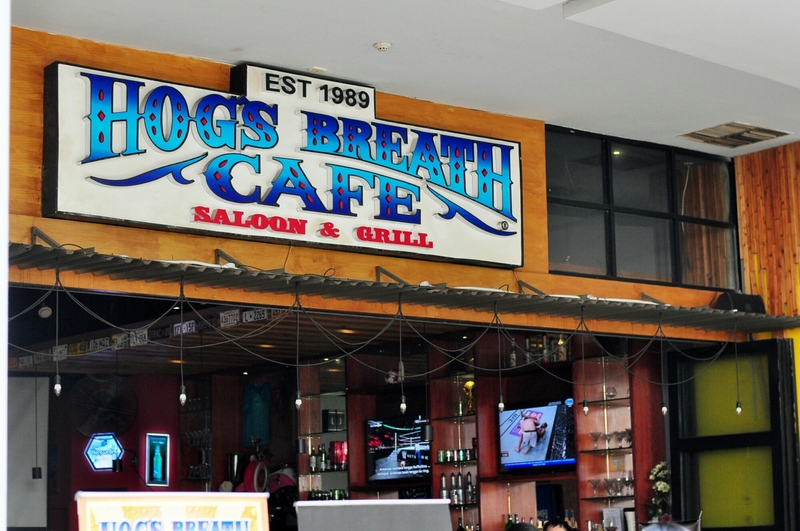 Hog’s Breath Cafe is an Australian chain first opened in 1989 at Arlie Beach serving a rich variant of western old school bbq and drinks. It is finally available in Jakarta. It is located at the famous Tribeca Park, Central Park Mall. I was very excited to finally try their rich selections of steaks and other classics. The place is open, so do not be disappointed when you don’t see any kind of air conditioner here. There is no actual door, just a really open space between the indoor and outdoor space. I can see myself come after 6 p.m just because it is cooler outside, and if you-re lucky you can see the water show from distance! The place is actually pretty cool. The bar is very convincing with a confident collection of boozes and drinks. The decorations keeps the restaurant’s original concepts with the brick walls and pictures everywhere. Other than the absence of air conditioning, i love how this place looks. Classics. There are no weird dishes. Just pure classics. We started our feast with this huge portions of Jumbo Combo of delicious deep fried goodies. It is consisted of curly fries, calamari, buffalo chicken wings, baked potatoes, and chicken strips . However for me the highlight of the dish is the calamari, as it is very well coated, crispy, and tender. The most exciting menu for me is the steaks. I love steaks. Especially when it is cooked just right. Hog’s Breath Cafe does it the right way. The meat is so juicy and pink on the inside. I love how you can cut it efforlessly and how the meat literally melts in your mouth tender. The meat has the right amount of seasoning too, even so, i recommend adding more black pepper. We tried two different toppings on our steaks, the shrimp and the cheese and jalapeno. I love the shrimp one better because the shrimp is so juicy and bouncy. The jalapeno is alright, but shrimp wins all the time right? However, the meat is the champ hands down. We got the chance to try two different kind of ribs. The pork and the beef.The pork ribs is supposedly to be the main attraction of the day. Usually i choose pork over beef 9 out of 10 times. This time though, i pick the beef. The pork ribs is very good, the portion is generous, with the right amount of sauce coating on the outside. The bones are tender and the seasoning is well infused into the meat. However, i think the meat is somewhat a little bit on the tough side for me. The beef ribs… is heavenly. You will have to prepare yourself for these 5 glorious huge ribs full of awesomeness. The sauce is dark and thick, make the ribs full of flavour. The meat is SO TENDER, i am not even joking. The texture is almost as soft and tender as beef brisket. The sauce penetrates deep into the meat. My favourite out of the two. We got ourself some special beverages here. The strawberry smoothies is very thick and sweet. Maybe some people who are craving for sweet stuffs will love it. The strawberries are very fresh in this drink. The shirley temple mocktail is a very pretty looking drink with bright orange and pink colour consisting of orange juice, ginger ale, and a splash of grenadine which gives the drink reddish colour on the bottom. I love the colour of the drink, and it is quite refreshing as well. It is a bit too sweet for my taste, but the sourness kind of make the drink balanced. The peach mojito however, is very tasty. I can smell the mint and lime quite well in this one. The alcohol is pretty strong too, but i can still enjoy it as the peach flavour make it easy for me to drink this one. In final conclusion, we enjoyed our experience in Hog’s Breath Cafe. I t is more on the pricey stuffs. However, if you are craving for some well made classics like steaks or ribs, this place will do good for your cravings! Try it yourself and enjoy! Indonesians love to eat. It doesn’t matter where you go in Jakarta, almost at every place you can find a food vendor. In general, countries in Asia like Singapore, Hong kong, and Thailand, people tend to hang out a lot later in the day. Most places are still open until at least 10 p.m. Indonesia is no exception to this rule, we just love to eat and hang out, regardless of the time. This place is open for 24 hours. You can come at any time of the day, 7 days a week. A very good thing since we can all get hungry at any time, Right? The place is located across a very well known university in Jakarta, Trisakti. Also there are some other big universities placed not too far away from this place, like Tarumanagara, and Ukrida. Considering the type of food this place serves, i think it can only be a good thing that those students can just come here at any time. Entering the place the kitchen is the first thing we gonna see. It is the biggest part of the restaurant. We were lucky enough to be seated outside, because i find it a lot cooler. The place is dominated with some bright colours, like red and yellow. There is no air conditioner inside the place, just some basic tables and fans. The best thing about this place, is that they care about their ingredients. We had a chance to talk with the owner, and he said that the restaurant use mostly home made ingredients. Yes, they make their own chocolate, peanut butters, and more. This Belgian toasted bread is my favourite out of all of the dish i tied. Maybe, because i have a very deep love with chocolate. The peanut butter was good, but the chocolate was even better. Its smooth and the sweetness is not too overpowering. The combination works really really well. The bread is still a bit too thick for me though. And yes, they make their own bread too. They call it Belgian because as the owner told me, the best chocolate come from Belgium. Oh well how about that Switzerland? The name is very unique on this one, selimut hijau means “green blanket”. Lady jutek means “mean lady”. The green blanket is understandable because it has green leafs as covering. The mean girl, probably represents the heat that comes from the hot sauce? Inside the “blanket” we will find toasted bread ( yes, the thick ones), with some tuna , some chili sauces, and potato pieces. It is very savoury, and satisfying, i actually quite like this one though. It tastes like a very warm and delicate sandwich. I can see myself eating this as replacement of main dishes. Well as long as it has meat in it i can deal with it. The name says it all. This thing is most likely the symbol of this place.Its basically toasted bread with this sprinkles of colourful toppings. Well at least each colour has their own unique flavour. A very attractive looking dish for your picture taking. This thing is pretty, but not for me. It is too sweet for my liking. However, it does look very pretty. The first drink is Teh mata kucing which translates to ” Cat eyes tea”. It is basically ice milk tea, with added lychee on top. The lychee represents the eyes. Maybe. I like this drink because you can really taste the lychee flavour infused into the milk tea. The flavours blend really well together and the fruity smell makes it very refreshing. Fresh milk oreo, is also quite good. The whole thing is not dominated by oreo cookies, therefore you can still drink it pretty easily. You still can smell the oreo in it, but it is not so overpowering that you need to over chew every single time you slurp it. Very fresh and balanced. I should mention that both of above items served in a very funky shaped glasses which i adore. Avocado juice is one thing i really love. Blend it with mocca and you get this thing. It’s not bad but not great. I don’t find the mocca to be necessary as it causes the drink to lose it’s essential scent, maybe it’s just me. I don’t hate it, but it’s my least favourite. I would not order it ahead of the cat eyes pr the fresh milk oreo 🙂 . Well i think this place really serves it’s purpose. Serving great food at any time with a very very good price. It’s not something very new or crazy by any means, but you can do a lot worse than IDR 13.000 toasted bread with homemade chocolate spread. I think the menu is a bit much too handle, as i prefer more simplicity.However, i respect the ideas and creativity that this place implement. Some of the food and drinks named with very ear catching names, along with their own backgrounds stories. My final thoughts is that the good pricing makes it worth it to come and try this place. It’s halloween yesterday! And we were at the Puri Orchard Apartment, Jakarta. Why? Because for second consecutive weekend, this place hosted a food festival called “Jakarta Foodies Meet”. We were very excited to go and luckily the traffic wasn’t that bad that night. The place was not as crowded as i thought. We were there around 7 pm to 8.30 pm. The first thing we did was checking the halloween costume competition. We were literally had our jaws dropped by the intensity of the competition. People really brought their best efforts. The costumes were ridiculously scary and real looking. I was shocked on how dedicated people were to make their costumes! Here are some of those scary looking “ghosts”! The food stands were very interesting. We had a pretty tough time to decide which one to get and which one pass. So here are some of the foods we missed but we think deserve to be looked at just to admire for a second. Lets drool! And here are some cute looking baby feeding bottles filled with heavenly good tasting milk from Shlurp. There are some flavours here like green tea, taro, bubble gum etc. We got the thai tea flavour, which was very pleasing. Tasted okay, with pretty generous portion of meatballs. very recommended. I personally prefer the meatballs than the fried wonton. This burger stand offer two different kinds of burgers. The one with red buns, and the one with blue buns. And just because of my obsession with the Smurfs, i picked the blue one. The taste of the meat is pretty good, pretty juicy and moist. However the negative here is that i find the bun a little bit too thick and sweet. I prefer the regular sesame seed buns but the shocking colours really stand out. And… yes i have a mouth with the size of your car. I personally wanted to try this one because of all the hype it has on Instagram. The looks is very promising. I picked the colourful cereals as my toppings.The taste? Love it! The cereals give the chocolate some crunchiness. The chocolate is thick and delicious. However, the real deal is the banana itself. Its literally frozen like ice cream, and the natural sweetness of the banana really kicked my tastebuds. This stand sells fish fingers with added twists. They add some chili flakes, mayo, and some seaweed to it. The fish is very crispy and flaky on the meat. The condiments really set this dish apart. Very very very good. The only downside is that the chili mix powder is a bit too salty for me, but in the end it is still made me wanting more of it. Price : idr 30.000 for fish only bowl. I actually enjoyed my time here. The costumes really made my halloween night feels pretty legit. The foods were decent too. I still found some regular looking foods here and there, but overall the prices are fair, and the place was pretty bright and the temperature was just right. (Sometimes such events can be a sauna). So that is all for tonight people! Hope you guys enjoyed your weekend as much as i did!